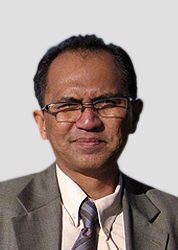 Dr Ahmad Shaharudin has many years of experience in the corporate and banking sector since 1988 involving internal and operational auditing as well as internal control reviews. He had handled internal audit and corporate services responsibilities of several public-listed companies in Malaysia before embarking into entrepreneurial activities in the ICT industry. He went into entrepreneurship activities since 1999 and has been awarded numerous projects by the government and private sectors. Before joining PBS, he was a fellow of the Faculty of Entrepreneurship and Business, Universiti Malaysia Kelantan and had taught entrepreneurship and IT-related subjects. He was also appointed as the Deputy Director of the university’s entrepreneurship centre, UMK Entrepreneurship Institute, and had taken the role of organizing and providing entrepreneurship training and activities for the university’s students. He obtained his PhD in Information Technology and Quantitative Sciences at the Universiti Teknologi Mara, Shah Alam, Malaysia with his research on ontology development for the Islamic banking using adapted software engineering approach.